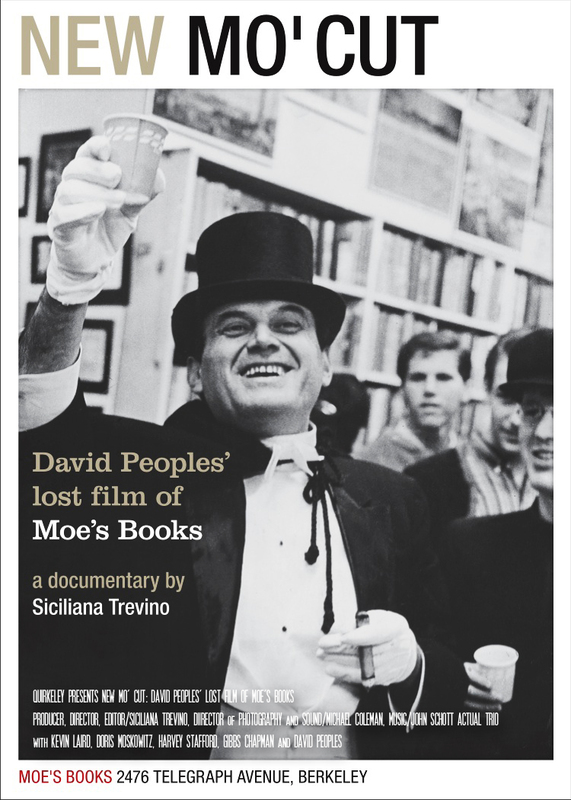 Join us at Moe’s Books at 7:30 pm for a special free screening of our award-winning documentary, New Mo Cut: David Peoples lost film of Moe’s Books followed by David Peoples’s found footage of the opening night party of Moe’s original Telegraph Avenue location, shot in 1965, and discovered at the Berkeley dump in November of 2014. The Kickstarter funded short won Best Editing at Tempe Arizona’s 2015 Filmstock Film Fest, and was an official selection at the 2016 Mill Valley Film Festival. It screened at BAMPFA as part of the 2nd Annual Area Book Festival’s Auteur, Author: Film and Literature series, curated by Tom Luddy, co-founder and co-director of the Telluride Film Festival. Moe’s Books is located at 2476 Telegraph Avenue in Berkeley, California. Join us Saturday June 4th at 7:30pm to see New Mo’ Cut at BAMPFA as part of the 2nd Annual Bay Area Book Festival‘s film series, Auteur, Author: Film and Literature, curated by Tom Luddy, co-founder and co-director of the Telluride Film Festival. Director Siciliana Trevino and Oscar-nominated screenwriter David Peoples will be in attendance. New Mo’ Cut will screen at 2016 Albany Film Fest Sunday March 20th!